Full disclosure: I was one of the contributing authors of the Bite Me!-kickstarter that also made this pdf possible. That being said, I had no hand in the creation of this pdf and consider my verdict not compromised in any way. This pdf clocks in at 23 pages of content, 1 page front cover, 1 page editorial, 1 page ToC (which also mentions that the characters herein will not show up in the final book), 4 pages of SRD and 2 pages advertisement, leaving us with 14 pages of content, so let’s take a look, shall we? Wereblooded of Clan Felis must take +2 to Dex and get 1/day a reroll for a reflex save and a +10 ft. racial enhancement to their speed when charging, running or withdrawing. Members of Clan Lupis may choose whether to take the bonus to dex or str, get +10 ft. movement rate and always treat Survival and Knowledge (nature) as class skills. Finally, members of Clan Ursus need to take the bonus to str and get +2 to saves versus fear as well as +2 to bull rushes and overrun-attempts while both they and their adversary are standing on terra firma. Now beyond the extenisve information on their roles, alignment and religion etc., we also get the RP-build-information for both the base race and the respective clans. The base race clocks in at 6 RP, with clans taking up 2 RP of these points. And now while I consider the ARG’s guidelines rubbish and the wereblooded to be stronger than what one would expect from “only” 6 RP (a great example of how the ARG-rules don’t work – at all), I do have to concede that the race per se is well balanced, perhaps a wee bit on the strong side on par with dwarves and elves – a fact that enterprising DMs can easily further develop by playing up potential social stigmatization. We also get 7 alternate racial traits – Desert-bred wereblooded can replace their clan with +2 to survival checks, whereas those bred on the mountain-ranges reduce the penalty to stealth while moving by 5 and may use it while running at -20 and those born in swamps get +4 to stealth in marshes as well as +2 to saves versus diseases, ingested poisons and the sickened and nauseated conditions. The desert-benefits are VERY weak here and could use an upgrade – when compared against the mountains and marshes and clan benefits, a paltry +2 to survival is not that impressive. Now the customization does not end there – we get 3 subtypes of the clans: Felis may instead opt for being cheetah-like, gaining +10 ft. racial bonus to movement and may chose a favored terrain in which they can ignore difficult terrain in exchange for losing their DR. Lupis may opt for the alternate coyote subtype, which also loses the DR in favor for +1 to Bluff, Disguise and Knowledge (local) and may 1/day roll bluff or diplomacy twice and take the better result. Finally, wereblooded from the frozen north that hail from clan Ursus also exchange their DR for polar-bear style 1/day endure elements at character level=caster level and get +1 Knowledge (nature) and Survival in frozen or arctic environments. We also get favored class options for all classes from the core rules, the APG-classes, the Magus and the Gunslinger. Personally, I think +1 to concentration for inquisitors and magi may be a bit strong, but I’m generally VERY cautious with any bonuses to concentration-checks in PFRPG. Now the pdf also offers one damn cool ritual following the Incantation-rules as used extensively by Kobold Press and pioneered by Zombie Sky Press – again, with full construction-notes: “Claim the Ravenous Hunter’s Form”, which allows the target of the ritual to essentially gain a semblance of a werewolf, complete with the corresponding power-gain. Now this one is story-telling gold – whether as an edge in battle, as a devious trick or to properly frame wereblooded or lycanthropes, this one is nasty and versatile – two thumbs up! 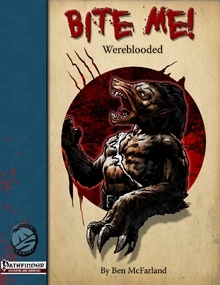 Now if you’re running a high-powered game (or are a DM looking for a further edge), there is also a “monstrous” version of the wereblooded herein, one that cannot be mistaken for a human – at 12 RP, they get +2 to Con (and +2 to Str or Dex depending on clan), -2 to Cha, 40 ft. movement, darkvision 60 ft, DR 5/silver and always treat stealth and perception as class skills. They also get a natural bite attack at 1d3 points of damage. The basic clan-abilities are not influenced or modified, but since the DR of monstrous wereblooded is higher, so the subtypes do get an upgrade: Monstrous Cheetah get +2 to initiative and the run-feat, Monstrous Coyote get +4 to bluff when lying and 1/day roll diplomacy or bluff twice, taking the better result. Monstrous Polar Bear Wereblooded get the 1/day endure elements spell-like ability of their non-monstrous brethren and also get +4 to con-checks and fort-saves to avoid fatigue and exhaustion and ill effects from running. forced marches, starvation, thirst etc. Now new rules are neat – new rules, ready to be dropped in a game without any fuss are even better – hence we are introduced to two new characters, first of which would be Sabra, Daughter of Katja Four-Named, a wereblooded felis rogue 3 in both regular and monstrous version, a catgirl temple-thief and Fyodor, son of Yuri Seven-Named, a polar bear ursus barbarian 7 of the hardiest stock who has no tolerance for softness and thus might make for a problematic guide. Both characters come with awesome full-color artworks depicting them as well as 2 adventure seeds. Editing and formatting are very good, I didn’t notice any significant glitches. Layout deserves special mention here – with blood-spatters on the sides and a fitting, easy to read font, this pdf’s 2-column layout-standard is glorious to look at – further enhanced by the 3 full-color artworks and 2 one-page b/w-artworks (by Peter Bradley and Jacob Blackmon) that all are original and beautiful to look at indeed. The pdf comes fully bookmarked for your convenience. Furthermore, we get a very printer-friendly b/w-version – neat indeed! Award-winning author Ben McFarland has an excellent reputation and there’s a reason for that. Still, every time I see RPs, my alarms go off – all too easily, the ARG can be used an example for a deeply flawed system justifying unbalanced design. This pdf’s races, however, do NOT and let me make that abundantly clear, fall in this trap – the wereblooded, both of their incarnations, each fitting a niche in campaigns of respective power-levels and content- as well as theme-wise this pdf delivers. The production-values are superb and should leave no one unimpressed, offsetting the price-point, which is not too cheap. Still, layout, content and artworks mean that I still consider it okay regarding bang-for-buck ratio. Now, this sounds like a 5 star + seal of approval file and yes, it is a neat buy – but not a perfect one: I do have two minor complaints: Desert-based wereblooded get the short end of the stick with rather weak bonuses compared to what they give up. And we don’t get age, height and weight-tables. While the latter may seem like a nitpick, lighter Felis, heavier Ursus etc. would have made sense to me and, at least to me, these tables are not optional. Hence, I can’t rate this the full 5 stars and will instead settle on a final verdict of 4.5 stars, rounded down to 4 for the purpose of this platform and still a definite recommendation for both DMs and players who’d love to play a balanced race in touch with their inner beast. You can get be a scion of blood tainted by lycanthropy here on OBS and here on d20pfsrd.com’s shop!